The best MIDI keyboard controllers are becoming more and more popular today, seeing that technology continues to improve and musicians everywhere are slowly beginning the migration process of switching to a digital setup (or at least a hybrid with both analog and digital setups). I know people who still abide by analog-only equipment for mixing and mastering, but still use their MIDI controller frequently for various production in their studio. We’re huge fans of keyboards and although we still love real synthesizers and drum machines, you just can’t beat the cost-effectiveness and overall usefulness of a keyboard that is custom depending on which virtual instrument you’re using, creating an endless amount of possibilities for sounds and effects. Let’s review the top 10 best MIDI keyboard controllers available today — both for those who want the best of the best or are on a budget and want the most affordable. What is your budget? This is the most important question to ask. There are numerous choices for any price range, from under $100 to $500 or more. Typically, the higher the key count (which is next in importance below), the higher the price. You’ll also see some extra software included in packages which sometimes increases the price tag, so keep that in mind as well. How many keys would you like your controller to be? There are numerous options, such as: mini-compact 25, 32, 37, 49 (the most popular), 61, or even 88 (the highest — the equivalent to a real piano). Who know those want 88 to truly replicate the look and feel of a real piano, while others who travel a lot, use laptops, or merely don’t mind go with the 25-key option. It all depends on the person. Synth action: Most of the popular MIDI keyboards come with “synth action” keys, meaning they’re made of plastic and use springs (instead of actual weights) to return the key to its original stance once you’re pressed and released it. The feel is a bit quicker and lighter than other weighted models. For music types and who likes to use them, it’s pretty broad– they work with most genres and really just depends on the person and how they like to play. Semi-weighted: These aren’t made of plastic and springs, but instead combine the spring-loaded build with a built-in light weight for each key. It’s a bit in the middle for when you press it (as compared to the lower end and quickness of synth action, while up next with weighted are heaviest). Fully-weighted: Most digital pianos have weighted keys because it attempts to truly emulate what it feels like playing the piano. It isn’t completely like playing the real thing, but you’re super close. It’s rare to find a MIDI keyboard with weighted keys, but the more expensive models do have them. Is portability important to you? If so, you need to keep the overall size into consideration. As stated previously, 25-key and other “mini MIDI keyboards” are ideal for traveling, but we’ve transported our 49-key numerous times, especially for performing live. Do you want your controller to have MIDI pads? A lot of keyboards coming out nowadays include ‘drum pads’ (although not just for drums, other sounds can be assigned to them, too), typically within the 8-16 count range with 3-4 possible banks. If you want a (almost) drum machine built-in to your MIDI keyboard as well, this is your best bet to consolidate. Are any other functions desired? Such as knobs, faders, buttons, arpeggiators, mod and pitch bend wheels, or various other performance controls. These are all pluses, but not necessarily musts. Try to keep in mind the way you work, what kind of music you make, or which extra features you see worth the extra money. Does the software bundle included with the keyboards matter to you? Some come with hefty programs, such as full on digital audio workstations, while others some FX or VST’s (sounds to use with your MIDI keyboard) while others do not. Fore more information on this aspect of shopping, we recommend reading Sweetwater’s how to choose your MIDI controller article. Or if you want an alternative to MIDI, read our top 10 best digital pianos or 10 best synthesizers articles. Some say MIDI keyboards are one of the most important pieces of music production equipment when building a studio. 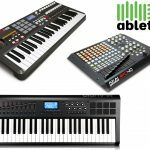 Below is our list of top 10 best MIDI keyboard controllers available today. Most of these come in different key counts, provide various additional functions as well as include pads and some decent software bundles. Sift through them and see which fits your budget and overall preferences. If you need some sounds to go with your controller, remember to check out our best VST plug-ins post. This is one of our favorites and at the moment top pick for the best MIDI keyboard controller available today. Novation music makes us scratch our heads in confusion with how a controller of this caliber can have such a solid build, include pads and other external functions at almost half the price of its competitors. The Impulse is one of the best MIDI keyboards in the market today and we’ve listed it at #1 for a reason: build, key\pad make, etc and budget ratio is almost-perfect. The only downside would be the lack of software bundle, but nowadays a lot of companies are trying to use the inclusion of DAWs and VST’s (ones they make for that matter) to justify an ‘upgrade’ or merely a higher price for the controllers. The Impulse does come with Ableton Live Lite and two pretty good VST’s. It isn’t necessarily as good of a build as Akai but it gets the job done very well. It’s won our best MIDI controller for Logic and a few others as well. 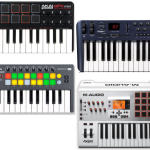 The original MPK series of MIDI keyboards by Akai Professional took the market by storm and quickly became one of the favorites in terms of MIDI music equipment. They’ve come out with a brand new upgrade of their beloved keyboards and they’re very solid in terms of stability and overall assignable functions, not to mention a rather hefty software bundle. Aside from the mini, all key count models come with Ableton Live Lite, Hybrid 3.0 virtual synth, SONiVOX Twist 2.0, and MPC Essentials software (an almost-worthy DAW — we’d still recommend grabbing a more reliable software). Their key make is some of the most solid we’ve felt thus far and the drum pads are RGB backlit and velocity-sensitive — they know what they’re doing. You have a lot of options in terms of key-count and price, ranging from a mini 25-key to a full on 61 key. A bit more expensive than the Novation keyboard but if you’re looking for a better software bundle, an arpeggiator and an overall better build, grab an MPK2. It’s one of the best MIDI keyboards out there and the user reviews don’t lie. Update: They’ve just come out with their new “Advance” MIDI keyboard, so we’re going to see how they stand the test of some time first before we replace it with their MPK2 series. Stand by! We love this keyboard by M-Audio because of it’s lower retail price for those on a budget. It’s absolutely perfect for those who don’t need pads or other fancy controls — it keeps it simple with only keys, a pitch and mod wheel and a few other functions. Even more, M-Audio has continuously upgraded the Keystation as time goes on. We had the II roll out a few years ago, and now the MK3 on board with even better stability and features. Just the essentials at a very affordable price. We personally don’t use knobs and faders, and really don’t touch our pads much. We’re into just keys for a MIDI keyboard, but when we do perform live, tend to break out our other keyboard (MPK2) for that. So this is better for home studios who don’t need a bunch of random buttons but instead simply a nice keyboard to play some MIDI data on. The key make is solid for the price and is synth-action (a bit more springy than semi and full-weighted, which I like) and comes with a nice software bundle of AIR Music Tech Mini Grand, AIR Music Tech Velvet, AIR Xpand!2, and surprisingly, Pro Tools (M-Audio Edition), as well as Ableton Live Lite. They’ve also made this one iOS compatible with a connection kit (sold separately), so if you make tunes on your Apple device this would be nice as well. Here’s the latest heavy-hitter from the beloved Native Instruments, and when we first heard about the release we were ecstatic. Before you let the price tag steer you away, check out the specs and overall intention of this MIDI keyboard. We first and foremost only recommend grabbing this if you use N.I.’s popular Komplete VST bundle because it is literally made for that piece of software. As in, each button and side nifty feature is meant to pair up with the VST on your computer. Don’t get us wrong — you can still very well use this model with other VST’s; however, it may not be worth the money and you would be safer grabbing another high-end MIDI keyboard that has pads and faders, or merely a cheaper price to save you some money. The Launchkey is one of our favorites. It’s a step down from our all-time best Impulse previously spoken about, so we recommend going with this if you want to save a hundred dollars or so. The drum pads are a bit smaller than the Akai or Oxygen (which bugged us at first but we ultimately were able to get used to it), but it does have assignable faders and buttons (no knobs), as well as pitch bend and mod wheels. Overall build and stability are great as expected from Novation (not as good as Akai but still solid) and it comes with Novation V-Station and Bass Station VST (PC and Mac), as well as their Novation apps for the iPad, so it’s a huge plus if you use iOS for music (seems to be getting more popular lately). This also won our best MIDI keyboard or controller for Reason award. 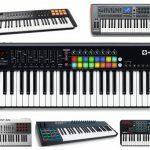 M-Audio makes an appearance again with a brand new MIDI keyboard line that isn’t budget-friendly at all, but well worth the price if you’re looking for more than just some keys and pads. Coming with some very nice quality velocity-sensitive keys with aftertouch, we’re also given 16 velocity-sensitive pads that are of course assignable, but can also be coded to color LEDS, CC or note values. The typical pitch bend and mod wheels as well, but numerous faders, knobs and buttons you can assign if you’re into automation (great for performing live as well). In terms of software packages, let’s take a look at what we have here. Ableton Live Lite, Loom (additive synthesizer VST with features such as a morph pad — more of a create-your-own synth software), and Sonivox Hybrid 3 (more synth software). To us the software is pretty underwhelming, but nowadays we don’t many who buy MIDI keyboards just because of the software bundle. Overall this keyboard is for those who want a higher-end build and extra features as opposed to just keys. We own quite a few pieces of music equipment by Behringer. In our opinion they’re one of the top 5 best brands when it comes to affordable gear. 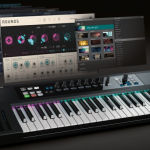 The U-Control UMX is rather unique, featuring a solid build of keys and a few assignable controls. We also included this in our best 61 key MIDI keyboard controller article. It comes with 100 virtual instrument sounds and 50 different VST effects, although some of these are just a bit preset-sounding in our opinion. The keys are relatively nicer, not as good as the Akai or Novation but they still do the trick (you get what you pay for). They’re velocity-sensitive and full-size. It also comes with its own audio interface for some external control of the volume and other functions. You just can’t beat the quality and price this one packs. The 61-key is one of the cheapest we’ve seen, albeit lacking pads and faders. This keyboard by Korg instruments is even simpler than the M-Audio controller we mentioned earlier in the article. These are very affordable as one of our favorite budget-friendly picks and what’s nifty is their offering of a rare 37-key model, although it isn’t available in the popular 49 count. This MIDI keyboard is exceptional in terms of lightweight and portability. The keys are velocity-sensitive and they feel pretty nice considering the price. It is USB powered so you don’t have to hassle with an adapter and you also get an octave shift and key transpose button, alongside the nifty pitch bend and mod wheels. Super affordable and very simple. Doesn’t come with any price-adjusting software bundle either, besides the free download of their KORG KONTROL Editor. A raw, here’s-what-you-get keyboard by Korg. Grab this if you want a convenient keyboard that doesn’t take up half of your entire desk, or if you travel with your gear a lot. 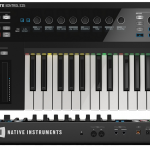 Arturia music instruments is typically known for their synths and other modern-day analog sounds, but this gives MIDI keyboards a slightly different spin. It comes with their Analog Lab software that was 5,000 synth sounds taken from a range of their classic synths (Prophet V, SEM V, CS-80V to name a few), so if you’re looking for some awesome synth sounds this MIDI keyboard controller is the way to go. We think this justifies the higher price if it’s what you’re looking for because it’s also a controller with 10 encoders, 9 sliders and 10 switches that are assignable. Not to mention the very nice key make, which are semi-weighted, velocity-sensitive and have aftertouch. Lastly it includes some pads so this thing really has it all, especially the sounds. It’s worth it if you have the dough. It looks cool, too. Here’s another one of the higher end models by M-Audio. This MIDI keyboard has only 12 trigger pads but they’re on the better-quality side. Also includes 8 knobs, 9 faders and 3 banks for all assigned functions. The keys are synth-action and have aftertouch and you’re able to create your own velocity curves if you want to get fancy. 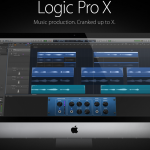 Lastly, a huge hit with this keyboard is the inclusion of Pro Tools Express and Ignite by AIR. If you already have your DAW setup going, it isn’t necessarily a must; however, if you want to switch over to Pro Tools and join the industry standard with it, we recommend trying it out. Just a nicer keyboard than most. 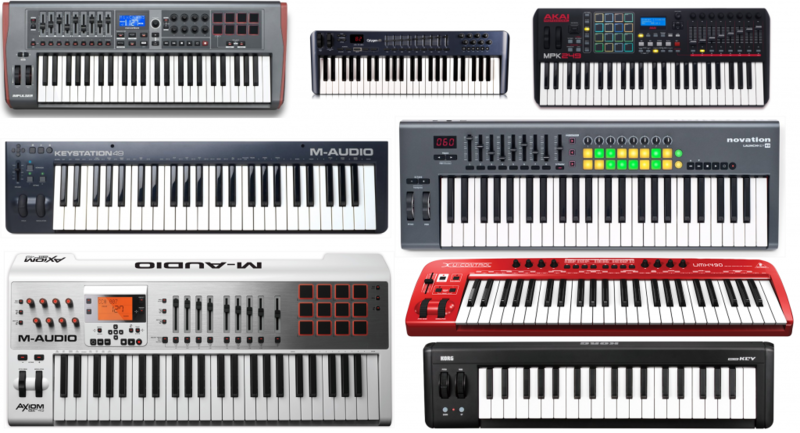 Which MIDI keyboard controller do you have/did you choose?